I was recently given a Zoom. They are wonderous things with many mics and the ability to record in such high quality that it took me an entire day to transfer this file to the lovely Daniel B Yates (that or my computer’s as slow as I’ve always suspected). ANWAY. Scroll down on the Exeunt main page and you’ll see little old me. Have a listen. What do you think? Created by a team of writers aged between 17-30 – the winning entrants of Write to Shine, a joint competition run by Shine TV, National Youth Theatre and IdeasTap – Our Days of Rage is an intelligent, multifaceted piece of theatre, which takes a visceral look at the crises in the Middle East and North Africa, while also casting a wry and eerily pertinent glance at the UK. NYT are on superb form in this production as they unflinchingly examine recent violence both overseas and at home. Subtlety may not be in this company’s vocabulary but when you give previously unheard voices a microphone, chances are they’re going to shout. The cavernous Old Vic Tunnels have been used to maximum effect in a consummate piece of promenade staging from director Paul Roseby. 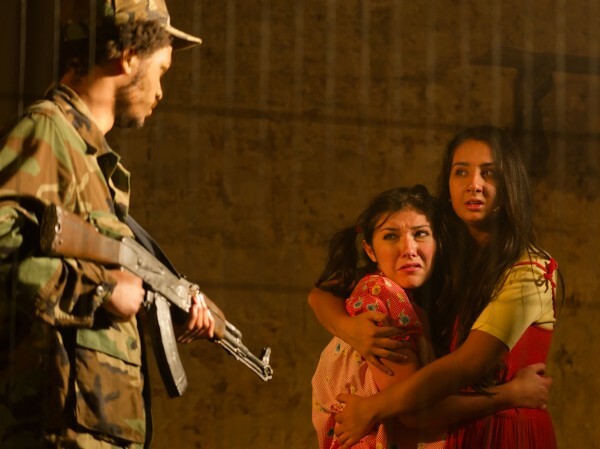 From the rise of Colonel Gaddafi to the radicalisation of a young generation, the audience is presented with a tragic unfolding of events which just serves to perpetuate the idea that only violence can bring about change. Within this labyrinth of tunnels, school rooms and street corners are revealed and time shifts from the past to the present. The audience are put into compromising positions and asked to experience feelings of powerlessness and culpability. At one point, as we are surrounded by riot police pounding their shields with batons, I’m reminded of the protests in March and the power of a pack mentality. In an equally effective way the helplessness of the individual against the state is brought home. The piece is inspiring although a little bombastic in its approach. But while this is undoubtedly sledge hammer theatre Our Days of Rage benefits from a number of nuanced performances and sophisticated touches. In the middle of all of the noise Roseby and his passionate young cast create scenes of some delicacy. It is true that the rate at which the story is told can feel somewhat tidal, but the urgency does not drown out the artistry. In a large ensemble Roseby has a deft way of ensuring each voice is heard with everyone getting their chance to speak. This may seem like a cheesy ‘youth theatre’ concern but when it feels as naturally balanced as here, this ability to work so completely as a team should be something other companies aspire to, not look down on. The use of punchy punk music throughout adds an extra thrust to an increasingly full throttle production and the final scene in which rappers and artists reveal their responses to the riots is a joyfully cocky celebration of life in the middle of all the terror. Typical of NYT Our Days of Rage is undoubtedly an energetic piece designed to showcase the talents of a bright young cast, but it’s also an angry and vital piece theatre; together this makes for an impressive and exhilarating combination.